I’ve added some other starship models for download tonight – the Hawking and Ascension Class starships. The Ascension is probably most famous for being the main ship of Star Trek: Phoenix, but now you can make it your own! All are either in 3DS Max 2010 or .Obj format. I’ve also added a better .obj version of the Insignia Class mesh. Let me know if you have any problems with them…. Thickened the phaser strips – they were there all along but I had made them a little too thin for people to recognise easily. Redone the bussard collectors so you can see “inside” them. Added some detailing around the deflector, although I haven’t added to the deflector as I simply liked the effect. I’ve found time to start texturing John Eaves’ starship now, but it’s not quite ready for the world yet – hence it’s a little shrouded in darkness here. The nacelle detail isn’t quite right and I’m scratching my head a little about the panelling effect on the surface, but here it is for you to see it take shape. If you have any suggestions for the texturing, let me know! I’ve pretty much finished the actual modelling stage of John Eaves’ ship now, so I’ve started to turn my mind to painting it…I wanted it to look a little different to my previous ships. Here’s my first attempt and putting some basic colours on it. For those interested, I’ve used mental ray materials to create the glossy effects. If anyone has any tips on mental ray (it’s my first time! ), please let me know. I’m undecided on the colour of elements like the deflector still, so any suggestions would be appreciated. Oh, and I’m aware that some of you have sent emails that I am meaning to reply to. I shall drop you a line shortly! I also haven’t forgotten about some of the tutorials I’ve promised. Finally, when I’m done with the eaves class, I will definitely put it up for download. I haven’t had much time to devote to this lately, but I managed to steal a few hours tonight to work on it; the model now has some escape pods and a few more lights. 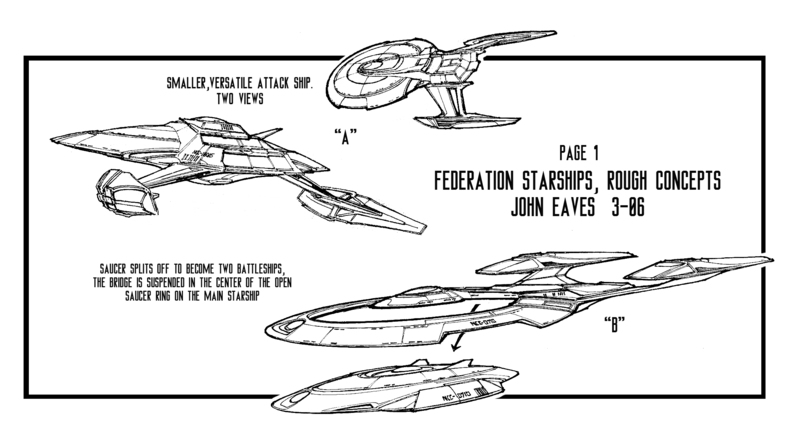 I also spent a fair bit of time re-modelling the front saucer’s deflector to better reflect John’s sketches. Eaves Class with detachable saucer…. The main work today was adding the windows. Boy, adding windows is not my favorite pass time. In 3DS Max, I use the shapemerge tool mainly and then clean up the result using the Edit Poly modifier earlier. See this tutorial from SciFi-meshes.com. On the whole the technique works well, but it takes such a long time and is very repetitive. If anyone has any quicker ways of working on this sort of thing, let me know! John sketched elongated horizontal window shapes on the ship, rather than the usual vertical windows you see on mid-24th century ships like the Enterprise-D. If you look on the future Enterprise J you could almost imagine there is a horizontal slant to the windows there as well. Almost. So you could argue that it was the start of a trend in the late 24th century which was continued on through to the Enterprise J era. Maybe. Sort of. I am imaginatively calling the ship the “Eaves Class” for now – there were a few ideas about the name from posts on John’s blog but I don’t think it got resolved…I shall leave this one to the public!